A well presented top of the range, 4 bedroom property on three floors, sleeping 6/8 and located at the end of a double terrace on the edge of the village, facing south, with pleasant outlooks across fields, to the village and a partial harbour view. The house has one double bedroom en suite with shower and wc and 2 bunk-rooms. There is a fourth attic room with a small double bed. Family bathroom with electric shower and wc. Open plan living/dining room and kitchen. The sitting room has two good sized, comfortable sofas, two wing chairs and a radio, free to air TV. All wood floors, electric convection radiators throughout. 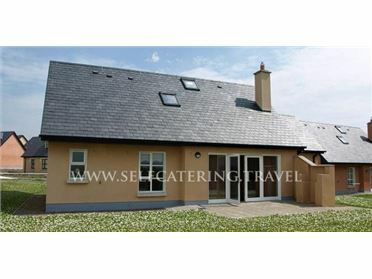 Spacious cottage style kitchen with dining refectory style dining area, and central work space with bar stools oven, ceramic hob, microwave, large fridge with freezer, dishwasher. Excellent ware and utensils everything of good quality and tastefully chosen. Utility with washer and drier. The house is private and well screened from neighbours, a neat courtyard garden with picnic table. Off road parking to the front of the house, which faces a large green ideal for children to play and totally visible from the house. Within easy reach of everything in the village, in small upmarket terrace it is perfect for anyone who cares about the aesthetics of their holiday home. Once inside the property there is a strong nautical and cottage like feeling created by tongue and groove panelling and decoration..